Indeed there is, and indeed they sell at least two products pitching themselves as a “healthier” bacon because they don’t add sodium nitrite. This is as odious as those sugar laden granola bars trumpeting “No Fat!” on their label—food marketers preying on a confused consumer who has been taught to fear food because of harmful additives (such as the recent, apparently genuine, Red Dye 40 warnings). Full disclosure if you don’t already know: I am a vocal bacon advocate, and one of my books, Charcuterie, relies on sodium nitrite and sodium nitrate for many of its recipes to cure foods such as bacon, ham and salami, so take all this with, um … no, I’m too pissed off to pun. Please, if someone can tell me what is wrong with nitrates (in green vegetables) and nitrites (in curing salts and in our bodies, a powerful antimicrobial agent in our saliva, for instance), I invite them to do so here. In the 70’s there were studies finding that at high temps, they could form nitrosamines, cancer causing compounds. I don’t disagree, but burnt things containing nitrite are bitter and unpleasant so we’re not likely to crave them in harmful quatities. Aspirin is not bad for you, right? Helps with a morning head and achy joints. It’s even taken for its heart benefits. But eat enough of it and it’s toxic. The fact is, most nitrate we consume comes from vegetables. Nitrate we consume coverts to nitrite in our body, which is a anti-microbial agent in our guts. Sodium nitrite in bacon cures the bacon (more info in my safety concerns for charcutepaloozians) and then converts to nitric oxide, so, while I’m not chemist, I have heard others suggest that you’re not actually consuming any nitrite by the time the bacon gets to you. Again, almost all the nitrate and nitrite in your body comes from veggies. It’s an anti-oxidant. Studies are coming out now saying it’s good for the heart. Bacon is one of the greatest foods on the planet, but the food marketers are going to figure out a way to make you buy their bacon. So what they do is use celery powder and celery juice (note the asterisk on the label above) as their nitrate source (celery is loaded with nitrate) and are therefore are allowed to say no nitrites added. Why go to the trouble? Because we don’t know any better. Can we really be this stupid? I have only one word to say on this beyond an emphatic yes. Don’t be stupid. Don’t let food marketers trick you. Eat natural, minimally processed foods. Eat a balanced diet. Cook it for yourself and the people you care about. Enjoy a little fat. Salt your own fresh food yourself. But whatever you do, stay away from too much celery. That stuff’ll kill ya. Dietitian Mary Saucier Choate shares a well-documented, decidedly less heated, assessment in Good or Bad? 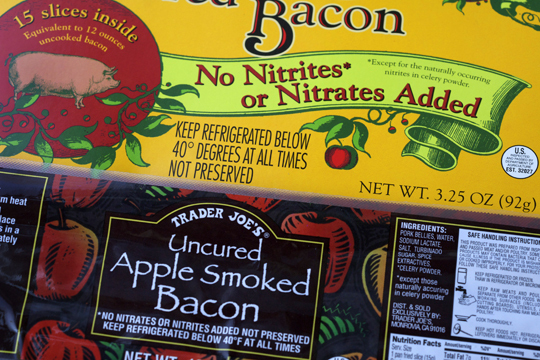 Nitrates & Nitrites in Food. Michael Symon’s Live to Cook, is a great addition to your kitchen. The Sustained Chef, Kevin Shinn shares his thoughts on charcuterie, life, and cooking. We became human because we began cooking food, my Had Something To Say Video Rant. As someone with food allergies, cancer, and a scientific education, a lot of the comments on this blog are beyond ignorant. Most of the cancer warning are based on a combination of epidemiological studies and direct animal studies where the animals are given high doses of the suspected carcinogen. So, they are not just nut-case pseudo-scientists making trouble for people. They are usually professionals trying to figure out how to keep folk from suffering through cancer treatment (which is Not Fun) and dying slowly and painfully, sometimes without the ability to ever actually eat again. Current cancer research is focused on the differences in how various people’s bodies respond to both potential carcinogens and cancer treatments (frequently one and the same). If you have a family history of stomach cancer, take it easy on fat and chemicals. If you don’t, take it easy on fat. Don’t ridicule people you don’t know. You are not living in their bodies and do not know their pain or struggles. I’ve suffered digestive issues (bloating, discomfort, slightly constipated followed by the opposite) after eating sausage for most of my life. After a while, I figured out I could eat breakfast (fresh) sausage without the issues, and if I only ate a small amount of cured sausage, the issues were minor (when I was younger). But things changed as I approached middle age. I developed major digestive issues, after approximately three years of medical tests and many drs, the third GI figured out I’m probably highly sensitive to certain food additives. Since he said there weren’t any tests to narrow down WHICH additives bothered my gut lining, for me to cook from scratch, then slowly challenge myself with my favorite commercial foods to see if I tolerated them. My husband bought me an electric meat grinder so I could make fresh sausage from shoulders and butts, and no issues, yay! I’m curious if I might tolerate traditionally cured sausage, since according to the article I pasted above: “The problem is when the cure is rushed, NO2 doesn’t disappear like it does when you cure traditionally over thirty days.” It would be great if I could tolerate traditionally cured sausages, for they’re much yummier than fresh. Does anyone know where there’s traditionally cured sausage in Houston (preferably the southern part – I’m a bit north of Ellington/Clear Lake region)?